All ages welcome. Register your group for a FREE STEM field trip! Admission to NextGen Expo is free with pre-registration online. Food vendors will be available on site for meal purchase. Free parking is available to all. Buses are welcome! EVER USE A VEX ROBOT? Borrow ours or bring your own VEX robot to compete in a skills challenge! 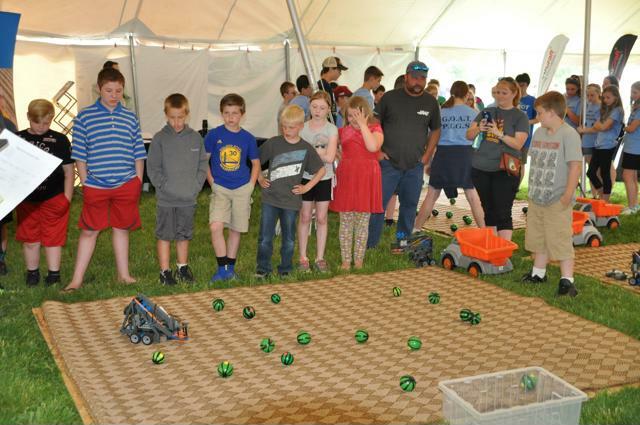 VEX IQ and VEX EDR systems can be used to complete a simulated agricultural task. 2018 was a Simulated Watermelon Harvest! More details about the 2019 skills challenge will be announced – stay tuned! For more information contact Rachel Gerrish at agbotchallenge@gmail.com. Challenge Competitions, see their cutting-edge robotics for agriculture! science, artificial intelligence, weed science, machine learning, rural broadband and more! the Agronomy Center for Research and Education (ACRE) grounds. the Indiana Corn and Soybean Innovation Center.